Alhamdulillah that Mawlana Shaykh inspire within our hearts always for deeper understanding. And from mulk to the levels of malakut are oceans of difference. The mulk of what we understand in dunya and our dunya understanding, by the time you move it into a timeless reality of Allah ‘Azza wa Jal’, Allah ‘Azza wa Jal’ has no time, it’s the world of light. It infinitely expands. For those who are coming, new, one understanding for you to get a grasp of the world of light is that if you add one with one- a form means if you take one form and one form you add, it’s two. 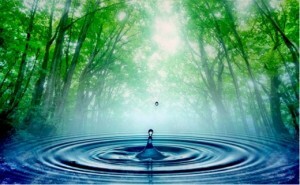 But if you take the liquid and add one drop into that ocean, add another drop into that ocean, it still remains one. So not everything of one plus one equals two. Depending upon what you’re adding, that is showing us the real tawhid, that when we lose the world of form, when we lose the understanding of the body and moving back towards our soul; and that which is dayem is eternal, has a completely different understanding and reality. What Does ABD عبد mean in Dunya (Material World)? For Ahlul Ma’refa, it’s very important to understand. When you say ‘ABD عبد ’, this dunya has a different understanding of what ‘ABD عبد ’ is. And it doesn’t give its darajat, it doesn’t give its magnificence and it doesn’t give its munificence. The ‘ABD’ in dunya– somebody you abuse, somebody that you beat, somebody that you mistreat is an ‘abd, is a servant, is a slave. Allah ‘Azza wa Jal clarifying: that is not the reality of malakut, that the huroof of everything is the ingredients of that word. Means when we want to leave the world of form and move towards the malakut. Awliyaullah come into our lives and they begin to teach that: look to the huroof. When Allah ‘Azza wa Jal is calling something ‘ABD عبد ’ and Prophet sallallahu alayhi wa sallam describing, “The greatest title for me was AbdAllah عبدالله,” means there must be a big secret. And it has nothing to do with being called a slave and something you beat in dunya, astaghfirullah. This has a tremendous reality that you have ‘ya Ibaadullah, ya Rijalullah’; they are categories. Moving into that understanding, means just from the basics of the huroof, any time you want to know a reality, you have to start from the door. Means our journey is always from closest to us trying to reach that reality. عبد –We have to come to the ‘Dal د ‘ to understand what is this ‘Ayn ع’ , because everything has an ingredient. When Allah ‘Azza wa Jal naming something, we made the name something in dunya based on our bad character. That’s not from when it came from Allah ‘Azza wa Jal in Divinely Presence. The huroof of what Allah ‘Azza wa Jal has made of that will teach us its reality. Means this ‘Dal د ‘ is the ‘Daleel دليل, is a guide. The ‘Dal د ‘- Dawam دوام for all creation- it has to do with the guidance of that creation. 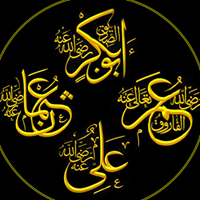 One of Sayyiduna Muhammad sallallahu alayhi wa sallam’s names is Dalail al Khayrat دلائيل خيرات, the Best of Guides. It has to do with the tremendous secret of this ocean. Reciting ‘Dal د ‘ ail al Khayrat has to do with the ocean of this reality. …for any to whom Allah giveth not light, there is no light! 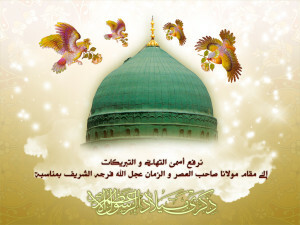 So then they begin to teach us that: when we want to know about this darajat of Abdullah, Abdallah is above Rijalullah. That’s why when we are doing the maddad: ya Ibaadullah, ya Rijalullah. Means they are teaching us that the first level of the Ahlul Haqqa’iq, when they come to realities, the shaykhs are making them to be Rijalullah. Means: come back towards the real manhood. This dunya has taken away that manhood. Come back to your covenant, come back to your promise. Manhood in this reality is both male and female; there is no gender specific. Means come back to the ahd عهد, to the contract in which you have given to Allah ‘Azza wa Jal of your realities: what Allah ‘Azza wa Jal wanted from us, what Allah ‘Azza wa Jal expected from us, what is chivalry. La fata ila ‘Ali. Futuha – chivalry. Chivalrous character, a noble character: all of that is based on rijal. All of that was Prophet sallallahu alayhi wa sallam’s teaching for his men and for his women of the community: come back to what is noble in your characteristic, to be true humanity, to be true humans. Means then they come to this ‘Dal د ‘ and this is a gateway into this reality. When they talk about the olul baab, the people of the door, ahbaab – the lovers, the people of the baab (the door), this is the door of that reality that they are taking us. That they have to first bring us back to be rijal, to be true to our covenant that Allah ‘Azza wa Jal has given to us, be true men. We say men but it’s not gender specific. The darajat of rijal, all awliyaullah are preparing their people and are always preparing their people to be the true men of God, true humans of Allah ‘Azza wa Jal’s Divinely Presence. They are teaching: you have to come to this ‘Dal د ‘ , you have to come to Dalail al Khayrat دلائيل خيرات, you have to come to the guidance, the best of guidance, the best of example which is the example of Sayyiduna Muhammad sallallahu alayhi wa sallam. Come into the Ba ب; this ‘Dal د ‘ is guiding us into the Ba ب. It’s taking us into that Ba ب. They want to return us to Bahrul Qudra بحر القدرة . Go back into your origin. And they say all of Qur’an is in Fatiha. 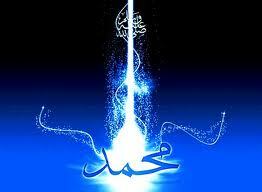 All of Surah Fatiha in ‘Bismillahir Rahmanir Raheem’ like a laser; all of ‘Bismillahir Rahmanir Raheem’ in the Ba ب. It means when we say ‘Ba ب ‘ it is an opening, because now with our understanding, like a laser it opens. So Allah ‘Azza wa Jal is that, this power of Holy Qur’an that is unimaginable power, unimaginable reality, the laser of it can be found in ‘Bismillahir Rahmanir Raheem’. Like a flower, where that came from- from the ‘Ba ب . That the ones whom Allah ‘Azza wa Jal has given the Malakut, Allah ‘Azza wa Jal puts ‘kulli shay’ because that Bahrul Qudrah بحر القدرة, that Ocean of Power encompasses everything. Malakut encompasses the world of form. You can’t have a form if your atoms and molecules are not within you. 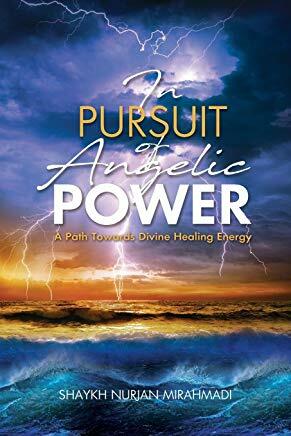 So it’s that power of malakut inside of you that’s even giving you an external form and an external presence. So then Allah ‘Azza wa Jal says, “That’s kulli shay.” Means that is the power of everything that you are seeing is an atomic reality, has atoms, has molecules, has oceans of power; all that we see is something that manifested it, like a hologram. 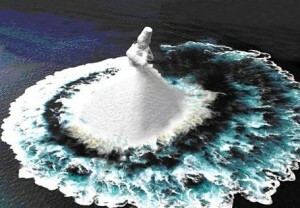 It’s manifesting but its source of power is in the Oceans of Qudra, what they describe as Bahrul Qudrah بحر القدرة. Means then the one who’s being guided into the Bahrul Qudrah بحر القدرة, when Allah ‘Azza wa Jal is happy with their character, happy with their akhlaaq, happy with everything about them, ‘ittaqullah wa ‘aleemukumullah; ittaqullah wa ‘aleemukumullah’. That’s why awliyaullah, they focus on good manners, good akhlaaq, good characteristics. People don’t understand their way, don’t understand the way in which they are training their students but they’re training it under the authority of Sayyiduna Muhammad sallallahu alayhi wa sallam, and that Prophet sallallahu alayhi wa sallam wants for them to be Rijalullah, wants them to be from `Ibaadullah; because Ibaadullah, when they reach a station of Ibaadullah, it’s not an empty title. It’s not you slave, oh a slave’s somebody you beat into dunya. No, no! When Allah ‘Azza wa Jal saying, “You are My servant means that you are someone serving Me but you cannot serve Me empty.” You can’t be an empty person serving Allah ‘Azza wa Jal. 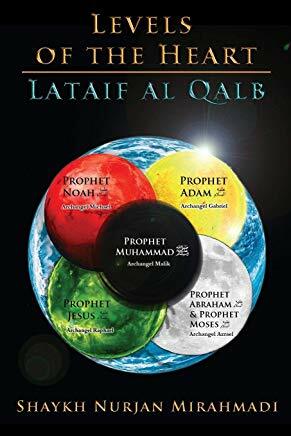 Ibaadullah, they serve with full authority from Allah ‘Azza wa Jal, from which authority- from Allah’s Ancient Sifat, because this is the door in which they are all moving to. They want to be dressed. When they’re asking, “Ya Rabbi, grant us, grant us,” What do you want to be granted? “Ya Rabbi, we want to be granted knowledges, ilm la duni, wa hikmati bis Saaliheen.” Ilm al la duni means to be dressed from Sifat al ‘Aleem العليم, Allah ‘Azza wa Jal’s Ancient Knowledges. That ‘Ayn ع’ is every reality opening from that ‘ayn ع’ . So Allah ‘Azza wa Jal dress you from Al ‘Aleem, “Dress you from my Ancient Knowledges.” And those Ancient Knowledges are every power and every reality that manifesting. Then they describe what was the first things that Allah ‘Azza wa Jal created, and they say the ‘Aql عقل. ‘Aql– again dunya people say, “Oh, it’s intelligence.” Huroof is teaching you that ‘Ayn ع’ is Allah’s Ancient Knowledges. Why is it the intelligence- means that if Allah ‘Azza wa Jal wants to give from Holy Qur’an قرآن , it’s coming from a source of Al ‘Aleem. Allah’s Ancient Knowledges are the power that’s moving from Holy Qur’an and moving out towards creation. Then what do you see? Aql عقل You see ‘Ayn ع’ and a Qul قل. ‘Qul قل`is Allah’s Divinely Speech. So when Allah ‘Azza wa Jal going to dress an `abd and grant them to be from Abdullah, to be from Ibaadullah, they are not empty. It’s not slavehood in dunya. Many people, they say, “Okay, what does abd mean? Somebody has lots of zikr?” No, no! These are titles in which Allah ‘Azza wa Jal can only give that title. And the sign of that title means they are the best of guides (from Daleel دليل). They are dressed from Bahrul Qudrah بحر القدرة, means they are dressed from secrets of Holy Qur’an. Why- because they carry the flag of Al ‘Aleem العليم . Allah ‘Azza wa Jal gave to them Sifat al ‘Aleem and dressed them. They are the knowers of the reality. What was Sayyiduna Abu Bakr as Siddiq’s name? 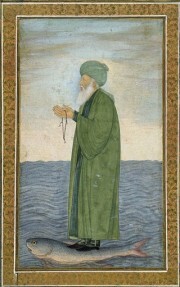 It was `Abdullah عبدالله ; Sayyiduna ‘Umar عمر – ‘Ayn ع ; Sayyiduna ‘Uthman عثمان– ‘Ayn ع ; Sayyiduna ‘Ali علي ridwanullahi ta’ala ajma’een. Ta abud The hadith is interesting because they don’t translate the hadith, they give you the Arabic and the English. And they say that to pray to Allah as if you can see Him. The word is not ‘pray’ but ‘ta abud’. ‘Ta `abud’ is to serve. Serve Allah as if you can see Him. That is a darajat (station)! And in that holy hadith, Prophet sallallahu alayhi wa sallam is talking not to everyone. “And if you can’t see Him, know He sees you.” He is talking to the Abdullah, to the ones who are serving and in that ocean of reality, that they can’t ta `abud, they cannot serve Allah ‘Azza wa Jal. With ta abud تعبد is a Ta ت with an `Abd عبد . You can’t serve, you can’t serve Allah ‘Azza wa Jal if you are not dressed from this reality; so you serve yourself and your own desires. So it’s a very different darajat. In dunya we’re all calling ourselves, “We are Abdullah, you’re Abdullah, I’m Abdullah, we’re Ubai’dullah. We’re all `abd. ”No, no! It’s not true, because you are not showing the rank and respect of Sayyiduna Muhammad sallallahu alayhi wa sallam, Khulafa ar Rashideen al Mahdieen, most guided, most dressed by realities. And then all of them who are inheriting, just a drop of that reality. So they are teaching us that: the turoqs, they come to make us rijal, perfect your character, be true, be honest, be clean, be purified. Then we can take into the oceans of Abdullah where Allah ‘Azza wa Jal begin to dress them from ‘Dalail al Khayrat; dress them from that ‘Dal د ‘ , bless them. 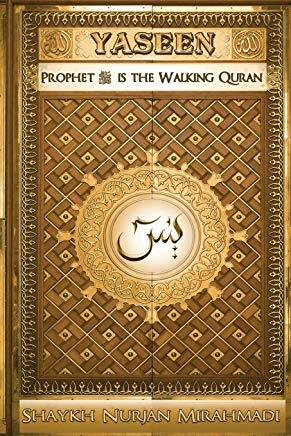 And Surah Mulk, “Tabarakalladhi bi yadihi,”- means there’s a tabarak also in their hands. 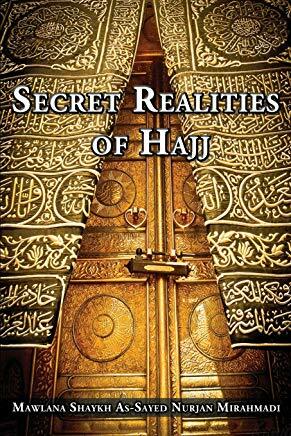 These servants of Allah ‘Azza wa Jal, whether they are Rijalullah, means Rijalullah, they are in that ocean and Allah (‘Azza wa Jal) has not yet opened for them to be from Abdullah, to be dressed from that reality. Those that are dressed from that reality, they carry those knowledges and they carry those realities. We pray that Allah ‘Azza wa Jal give us a greater understanding always. That the sahib and the owner of all realities is unimaginable station, unimaginable dress, unimaginable realities. And that when we try to equate that into dunya, it becomes very small, it becomes very disrespectful. So it’s always our responsibility to raise the tashreef of Prophet sallallahu alayhi wa sallam, that that reality, that station is not a station that we can easily achieve- it’s loaded. When Allah ‘Azza wa Jal says, “I want you to serve Me,” He gives you everything. He gives you every knowledge, every qudra; He make all malakut, all the angels, all the jinn, all servants to serve you to serve His creation. You become fulukul mashhoon. You become something loaded, loaded by Allah ‘Azza wa Jal’s Powers, loaded by Allah ‘Azza wa Jal’s Rahmah, loaded by Allah ‘Azza wa Jal’s Love. That is a loaded title. We pray that Allah ‘Azza wa Jal dress us from these realities, bless us from these realities, inshaAllah.